» Forum » Game manufacturers » Stern Pinball » Initials written on a IMVE? » Initials written on a IMVE? Initials written on a IMVE? 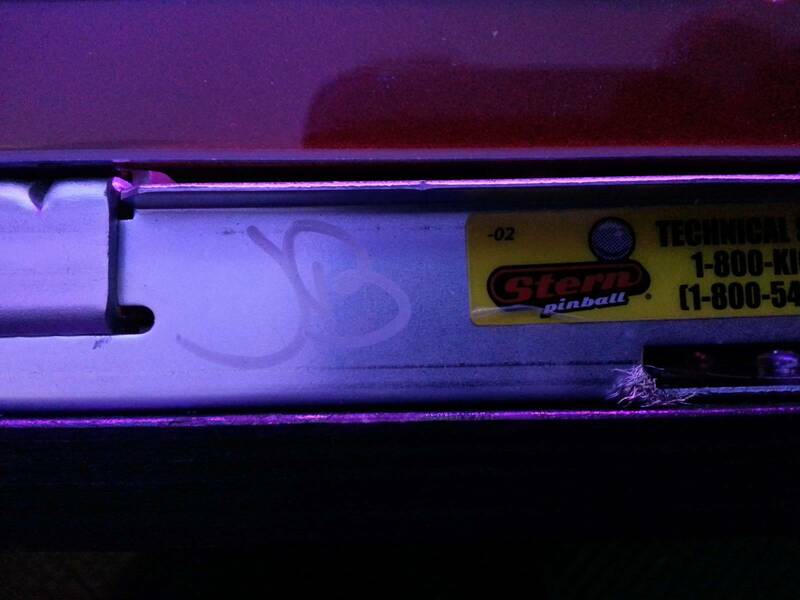 My friend discovered the initials JB under the lockdown bar on his new Ironman VE. We thought they might be John Borg's initials, written by the man himself? However, while 'J' looks good to me the 'B' seems very different to that from his signature found on the LE playfields of other games. 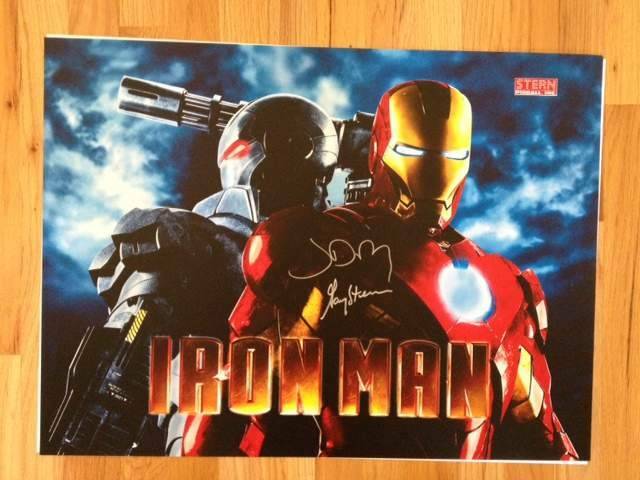 Though it is just initials and not a signature. So any one might know why it's there? And has anyone else have this written on their IMVE or other pinball from Stern? The J looks identical. Is it on any other Im's I wonder. The B looks like a D in the sig tho if you look at the little hook on the inside of the D and B is identical too. Wonder why he would randomly initial the game? Looks like his JB. Now every one else will be checking their games. Could be markings made at the factory that has something to do with the assembly or quality control process. I'd laugh if the next pinball release is a Borg game and he was just testing the pen out before signing the LE play-fields. Lol.. I'm imagining a couple production line guys sittin' on their computer going, "look, we got it on pinside. Nyuk, nyuk." The most simple answer is often the correct answer. No different than the "inspected by Raul" stickers. Could be. But the writing looks very much like his. So someone has gone to the trouble of mimicking his writing the put it under the lockdown for what purpose? And if it's some kind of quality control lets see more IM's with this on it. Maybe the simplest answer is... It's his initials. It is the intitials of the infamous line worker. Juan Belidisto. He is the quickest lock down bar reciever installer in all of Stern and he only stands on a single piece of cardboard while working all day long. The legends are told that he is actually an illigitimate son of the one they refer to as 'el plata Liberace'. Definitely in the same lineage as Raul. If fatbeerdrinker could find a Raul playfield, this Juan Beldisto lockdown bar, and a Piccolo Zambini cabinet, it would be the holy trinity. contact stern....maybe you won a prize...like another brand new pinball machine!!!!! If it's a quality control thing or a parts code, and I'm not saying it's not, you would think that you would see more of it on other pinballs? Maybe they forgot to erase it. Maybe someone use permanent marker instead of erasable. Maybe something had to be double-checked. Maybe there was a new employee who did something different. There could a hundred different reasons. There aren't any initials on my imve in that spot. Just an FYI. What ever you do don't polish or wipe it off with solvent. The proof is here, or actually on your machine. Cool! I know EXACTLY what it is.....Stern wants to save money so instead of using expensive stickers with the inspectors name on it they just give them a cheap marker. Just seems weird that some random inspector has Borg's handwriting exactly. The O.P. could cover the initials with a small piece of mylar. This would help save it from being accidently removed. Let's just admit that this guy got lucky and say well done.